Uddhav Thackeray has formally taken over the reins of the Shiv Sena following the death of his father Bal Thackeray, he said in an interview published in today’s party mouthpiece, Saamna. However, he won’t formally adopt the title of Shiv Sena Pramukh. As the Pakistan People’s Party (PPP) government nears completion of its five-year term in office in March, New Delhi believes the civilian regime in Islamabad has shown sincerity in taking the bilateral relationship forward though it is hesitant to address issues of vital importance to India because of domestic reasons. Authorities in the country are facing a unique problem of storing and disposing of seized contraband, including high-quality liquor, international brands of cigarettes and firecrackers. The tax-exempted income of 10 main political parties over the past five years touched Rs 2,490 crore with the Congress and the BJP accounting for around 80 per cent of the exempted amount, according to official data. The land of Tata Motors at Singur is in the possession of the state government, but it cannot be returned to the farmers at the moment, Chief Minister Mamata Banerjee told the people of Singur recently. Unlike his predecessors, the new Parliamentary Affairs Minister Kamal Nath is proving to be extremely elusive. It is not just the media which is finding it difficult to track him but his own colleagues are also having a tough time pinning him down. Many Indian funds and portfolio managers from India are believed to have come under scanner in the US for serving clients there without the required regulatory approvals for such activities. Both Houses of Parliament will be adjourned for the day on Monday after paying tributes to former Prime Minister Inder Kumar Gujral who died on November 30. Gujarat Chief Minister Narendra Modi today targeted Ahmed Patel, political secretary to Congress chief Sonia Gandhi, saying the party wanted to make him the Chief Minister but did not have the courage to declare it openly. He also said the Congress had failed both in power as well as Opposition. The 28th anniversary of the world's worst industrial tragedy falls on December 3, but the toxic chemical waste at the Union Carbide plant premises here has not been disposed of and is unlikely to be done soon. After successfully getting the extension of former Uttarakhand Minorities Commission chairman Sukhdev Singh Namdhari’s police custody today, investigators will now try to unravel a conspiracy to kill Hardeep Singh at a Chhatarpur farmhouse in Delhi on November 17. Jupiter, the largest after the Sun in the solar system, will be at its biggest and brightest tomorrow night much to the delight of sky-gazers. 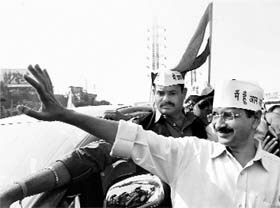 Civil activist-turned-politician Arvind Kejriwal launched the Maharashtra chapter of his Aam Aadmi Party (AAP) today. He held a rally from Mumbai to Roha in Raigad district on the occasion. Andhra Pradesh Governor ESL Narasimhan is caught in a piquant situation over the issue of granting permission to the CBI to prosecute the Roads and Buildings Minister D Prasada Rao in connection with the illegal assets case involving the jailed MP and YSR Congress Party president YS Jagan Mohan Reddy. In a first of its kind initiative in the country, Andhra Pradesh yesterday came up with a bill to provide legislative backing for Scheduled Caste and Scheduled Tribe sub-plans. This will pave the way for clear budgetary allocations for the weaker sections in proportion to their population. “Balasaheb will always be the Shiv Sena pramukh. He will never be replaced. He will also continue to be the original Hindu Hriday Samrat,” Uddhav has been quoted as saying. Shiv Sena spokesman Sanjay Raut told reporters that office-bearers of the Shiv Sena at a meeting on Saturday formally decided that Uddhav Thackeray would formally function as the head of the party. “It was decided that all powers exercised by Balasaheb will now vest in Uddhavji Thackeray,” Raut said. “All of us have decided that Uddhavji will help fulfil the dreams of Balasaheb,” he added. According to the party spokesman, all senior leaders, including former Lok Sabha Speaker Manohar Joshi, Sudhir Joshi, Leeladhar Dake, Subhash Desai, Ramdas Kadam, Gajanan Kirtikar, attended the meeting. In his emotional interview, Uddhav said he would continue to fight for the cause of Marathi Manoos and Hindutva espoused by his father. “I appeal to Shiv Sainiks to overcome their grief over the demise of Balasaheb and prepare to fight afresh,” he said. As part of his efforts to connect with the party workers, Uddhav Thackeray will begin a tour of the state from tomorrow. “I would like to thank them for the love and support they showered on my father,” Uddhav said. He went on to say that the Shiv Sena would go into the election mode from early next year. As per this plan, he would kick off a statewide tour to galvanise party cadres. Balasaheb will always be the Shiv Sena pramukh. He will never be replaced. He will also continue to be the original Hindu Hriday Samrat. He, however, went out of his way to explain that too much should not be read into his visibly increasing proximity with the Samajwadi Party. He outrightly rejected the idea of any possibility of his joining the Samajwadi Party and contesting the upcoming Lok Sabha elections. 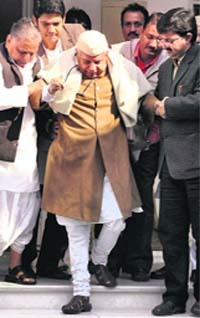 “I will not contest any election now as I am already 88-year-old and will be 90 by 2014 when elections are due. Is this a favourable age to contest poll?” he quipped. Evading questions about his reported disillusionment with the Congress, he asked the media not to ask such questioned as they would not be answered. Meanwhile, Samajwadi Party president Mulayam Singh Yadav utilised the opportunity to clarify that he did not consider himself in the race for the Prime Minister’s post in 2014. “I am not in the race for the Prime Minister’s post....I was also not in the race for becoming the Chief Minister, but the situation gave me the post. It all depends on the situation,” he said. On the issue of FDI in retail, he said he would make public his views in Parliament only on December 4. I am not in the race for the Prime Minister's post....I was also not in the race for becoming the Chief Minister, but the situation gave me the post. It all depends on the situation. “Our experience over the last two-three years with the civilian leadership has shown that the focus is on improving relations on the commercial side, particularly trade and connectivity, as also on people-to-people contacts,” senior government sources said. They pointed out that it was apparently dawning on the leadership in Islamabad that an improved relationship with India was in Pakistan's own national interest as it would fetch the country rich economic dividends. The sources said Pakistan was now ready to open with India in areas in which it was not even possible to imagine a few years back. They also referred to the upcoming cricket series between India and Pakistan in December-January, which has already led to an unprecedented excitement among the lovers of the game in the two countries. However, the sources emphasised that it could not be business-as-usual between the two countries until Pakistan showed sincerity in bringing to justice the perpetrators of the Mumbai attack. They regretted that the seven suspects accused of playing a role in the Mumbai mayhem were yet to be prosecuted in Pakistan. Despite repeated requests, Islamabad has still not provided to New Delhi the voice samples of the Pakistan-based handlers of the terrorists who massacred 166 people in Mumbai four years back. New Delhi is well aware of the fact that Pakistan's policy on India was not decided in Islamabad but at the Pakistan Army headquarters in Rawalpindi. But it has no intention to open a direct dialogue with the Pakistan Army and would like democracy to take roots in the neighbouring country. The sources also drew attention to Prime Minister Manmohan Singh's articulation on several occasions that peace with Pakistan was in the larger economic interest of India. He has long held the view that India could not take its rightful place in the comity of nation as long as relations with Pakistan were tense. Asked about the much-anticipated visit of Manmohan Singh to Pakistan, the sources said the trip has been on India's 'radar' for quite some time now. The PM himself was keen on the visit but at the same time, he also wanted that such a trip should be result-oriented and not an exercise in futility. The Directorate of Revenue Intelligence (DRI) has found that high-quality liquor and international brands of cigarettes are being smuggled in containers of various goods shipped to India from China and Dubai. Most of such products reach the black market. DRI's total seizure of smuggled cigarettes and alcohol this year is worth around Rs 4.94 crore. The Container Corporation of India Limited (CONCOR), which operates the Inland Container Depots (ICDs) in the country, is also the custodian of the goods smuggled in those containers. The Customs authorities are entitled to auction the seized products after settling various legal issues. However, in many cases, the procedure takes too much of time and most brands of cigarettes cross their expiry date (usually six months) before these could be auctioned. main trading ports at Mumbai. These are also smuggled via ports at Gujarat, Kochi, Chennai, Vishakapatnam and Kolkata. From the coastal areas, the containers are taken to Delhi by road or by rail. The DRI seized a consignment 1500 bottles of Black Label whisky, 864 bottles of Chivas Regal and 600 bottles of Grey Goose Vodka at Mumbai on October 3. The goods were hidden in a cavity in the container that carried iron-mesh wires. The liquor, worth Rs 1.44 crore, was sent from China. On November 1, the DRI seized a consignment of 50 lakh UK brand Maiwand cigarettes, and 30 lakh Gudang Garam Indonesian cigarettes. The Rs 3.5-crore consignment, which arrived from Dubai, was seized at the Tughlakabad Inland Container Depot (ICD) in Delhi. Another product smuggled into India is the R-22 gas, a refrigerant, which is a restricted item due to its ozone-depleting qualities. There is a high demand for this product in India since the Director General of Foreign Trade is known to have licensed only few companies to export and import it. In May, the DRI seized eight containers of smuggled R-22 gas cylinders and air-conditioners. The cylinders were sent from Malaysia. The DRI also seized a sizeable consignment of firecrackers from China in September this year. Sources say "a very small percentage of the smuggled goods is caught, the rest hit the black market, because it is not possible to check all the containers". The good seized this year are yet to be auctioned. "The government would receive a handsome amount of revenue if the smuggled goods are auctioned. But this rarely happens, as the courts do not give permission, demanding that the seized container be brought to the court. Although this would be evidence to book the culprits, it is difficult to bring a 40-feet container inside a courtroom. And when the judge does not see it, he can't approve the auctioning of the goods," sources said. The income can be more than Rs 2,490 crore since the political parties' income figures between 2007-08 and 2011-12 received from the Income Tax department through an RTI plea does not incorporate the large number of small donations or income below Rs 20,000. The Congress had a tax-exempted income of Rs 1,385.36 crore, more than double the amount recorded by the BJP (Rs 682 crore). The BJP ally JDU's tax-free income during the period, except for 2008-09, has been Rs 15.51 crore. Mayawati's BSP recorded an income of Rs 147.18 crore in three financial years 2007-08, 2008-09 and 2011-12. The party filed an incomplete return in 2009-10 and had no tax-exempted income in 2010-11. Sharad Pawar's NCP had a tax-exempted income of Rs 141.34 crore in five years. According to the information provided by the IT department, the CPM recorded an income of Rs 85.61 crore in four years in this period while it had nil income in 2008-09. The CPI's income in 2008-09 and 2009-10 is pegged at Rs 28.47 crore. The JD(S) had an earning of Rs 7.16 crore in 2009-10 and 2010-11, while Ram Vilas Paswan's LJP had a tax-exempted earning of Rs 2.55 crore from 2007 to 2011 fiscal. She said the matter was locked up in a court case. As soon as the issue gets settled there, the land would be returned to the farmers, Mamata promised. The Chief Minister today visited the SDO office at Singur after a gap of six years. She was allegedly beaten up and forced out of the premises during a sit-in there in support of Singur farmers on September 25, 2006. Mamata did not hold any public meeting at Singur today. Girl students at the local ‘madrassa’ were also not distributed free bicycles as promised earlier by the CM. His portly junior minister Rajeev Shukla virtually gets out of breath in his attempt to locate him or in keeping up with his frenetic pace. Last week, AICC general secretary and Nath’s colleague from his home state Madhya Pradesh Digvijaya Singh was heard making enquiries about the minister’s whereabouts from his office staff. A senior Congress functionary suggested to Kamal Nath that he should keep up the practice of briefing the media every Friday but to little avail. Known to be hyperactive and impossible to put down, Kamal Nath barely spends any time in his Parliament House office while his meetings, even with Opposition leaders, are brisk and business-like. The TINA (there is no alternative) factor is a well-known and accepted phrase in political circles. But a section of BJP leaders have coined a new term — the MJ factor — to describe the ongoing rumblings in their party following the controversy over its president Nitin Gadkari’s Purti group of companies. A faction in the BJP does not want Gadkari to get a second presidential term as they believe the charges against him have blunted the party’s anti-corruption campaign. But there is another group which is pitching for Gadkari’s continuation as party president, not because of its loyalty to Gadkari but because of what is being referred to as the MJ factor. Just as the internationally well-known singer-songwriter Michael Jackson was held in awe by his fans and also feared by others, the MJ factor is similarly dreaded in the BJP. And it is this fear which could ensure a second term for Gadkari. No prizes for guessing that MJ here refers to the Modi-Jaitley duo. Minister of State for Parliamentary Affairs Rajeev Shukla is known for his multi-tasking skills as he juggles his ministerial duties and responsibilities in cricket administration with his hectic social life. His skills will be put to further test this week as the crucial debate on FDI in retail in the Rajya Sabha coincides with his nephew’s wedding — being held at his Safdarjang Road bungalow. Shukla cannot afford to be lax about the debate as he is the government’s key parliamentary manager in the Upper House. Moreover, the ruling combine is in a minority in the Rajya Sabha while its outside supporters — the Samajwadi Party and the Bahujan Samaj Party — are keeping the government guessing about which way they will vote. One should, therefore, not be surprised to see Shukla shaking a leg at his nephew’s ‘baraat’ and then sprinting across to the Rajya Sabha for the debate. NDA convenor Sharad Yadav was in the same boat last week when the all-party meeting on the FDI row was held on the eve of his daughter’s wedding. Since he was getting frantic calls from his residence, he had to quickly say his piece and leave in the middle of the meeting. These entities also include those soliciting investments from institutional and individual investors in the US, including non-resident Indians (NRIs), in funds and portfolio products involving arts, real estate, commodity and various other non-equity assets, sources said. Last week itself, the US market regulator the Securities and Exchange Commission (SEC) charged four Indian brokerages -- Ambit Capital, Edelweiss, JM Financial and Motilal Oswal -- for providing unauthorised broking services to American clients. While the SEC agreed to settle the charges against these brokerages after a payment of more than $1.8 million (about Rs 10 crore) by them, the US market regulator might take stricter action against other entities from India being probed by it, sources said. Gujral breathed his last at a private hospital in Gurgaon, Haryana, on Friday. He was 92. He was cremated on Saturday in Delhi with full state honours. Patel had asserted yesterday, in response to Modi’s earlier insinuations, that he was not interested in becoming the Chief Minister of the state. During his election rallies today, Modi said: “Ahmed Patel has been saying for the past two days that he is not interested in becoming the Chief Minister.… What was the need to say this and why come to Gujarat to say this? “What it means is the Congress... and all those who have entered the arena to help the Congress win want to make Ahmed Patel the Chief Minister, yet the Congress does not have the courage to tell so to the people,” he said. Patel had yesterday issued a statement saying he had no such ambition. He had also dubbed Modi’s statement as one made by a “dejected and frustrated” person. Modi’s attack on Patel is also being seen as an attempt to aggravate internal rumblings in the Congress over seat selection. Modi went on to say that the Gujarat Assembly elections would give a new direction to the country. “After a decade (as Chief Minister), I can say that the country has realised that the road of vote bank politics was leading to destruction, while the politics of development is the right path. “The Congress has not only failed when they were in power, but also as an Opposition. “The role of the Opposition is important but there should be no place for negativity in politics. Yet, for the last 12 years, the Congress has done only one thing - to use all sorts of abusive terms from the dictionary for Modi,” he said. Taking a dig over the fiasco at Visavadar, where the Congress candidate could not submit his nomination papers because his party’s authorisation document was snatched away by a boy, Modi said even a 12-year-old child from the state did not want the Congress to get the mandate. Gujarat Parivartan Party candidate Keshubhai Patel, who earlier parted ways with the BJP, is contesting from the Visavadar seat. Modi also attacked the Congress through social media, accusing it of having an “anti-Gujarat mindset”. “The Madhya Pradesh government's efforts to dispose of the waste so far has been insufficient. The state government is worried only about the waste in godowns. It is not thinking about the waste lying in the open which poisons drinking water in the affected areas,” Bhopal Gas Peedit Mahila Udyog Sangthan's convener Abdul Jabbar said. About 350 metric tonnes of waste is lying in the Union Carbide plant premises and all attempts claimed to have been made by the state government to dispose it have been in vain. Initially, the Madhya Pradesh government was supposed to dispose of the waste at Ankleshwar in Gujarat and its state government had also agreed to it. However, the Gujarat government refused to accept the waste after people in Gujarat launched an agitation against it, at a time when elections are around the corner, besides it was also opposed by some voluntary organisations. After the Gujarat government's refusal, the MP state government had planned to dispose of the waste at Pithampur and 40 metric tonnes of waste was even burnt there. But later, it was claimed that the incinerator at Pithampur was not good enough for disposing of the waste, while BJP leader and former union minister Vikram Verma too led an agitation against the waste disposal. Attempts to get the waste disposed of at Nagpur and Germany too failed. “From the investigations conducted so far, it has been established that the accused, Sukhdev Singh Namdhari, has played a vital role in the conspiracy with the other co-accused, who acted on his instructions. On interrogation of the accused (Namdhari) and examining the witnesses, it has been found that on Namdhari’s behest, the co-accused armed with firearms and other deadly weapons forcefully entered and took possession of farmhouse No. 42, Central Drive, DLF, Chhatarpur,” said the police application that was submitted at Delhi’s Saket district court today. Hardeep’s driver Nandlal, on whose statement a police case in this matter was registered, had identified three persons among the alleged intruders on the fateful day. They were: Bisht, Anna and Premveer, who were employees of Ponty (Gurdeep Singh) Chadha, Hardeep’s elder brother. The application further stated: “In continuation and consolidation of the offence (illegal possession of the farmhouse), Namdhari caused the shootout at gate No. 3 and killed Hardeep.” Ponty was allegedly shot dead by Hardeep at the same farmhouse, which the latter allegedly possessed. A Duty Magistrate of the Saket District Court, Sunil Beniwal, today extended Namdhari’s remand by three days. Namdhari will now be presented in the court on December 5. The police application sought his custody for five days. The police had slapped Section 302 (punishment for murder) of the IPC against Namdhari for allegedly killing Hardeep. The police application mentions that Namdhari had “intentionally killed” Hardeep by shooting at him. After the gun battle, Namdhari directed his personal security officer Sachin Tyagi and Jasbir Singh, alias Sonu, to give the pistol and its ammunition to his associate Satnam, alias Satte. He also directed them to take the weapon to his native place in Uttarakhand. “After reaching home, Satnam got the pistol cleaned by a person known to him. The pistol and the rounds have been recovered,” read the application. The police claimed that Namdhari disclosed that he had directed Satnam and the other co-accused to hide in Amritsar, Ludhiana and Gurdaspur. The planet, which has a system of rings, is at its closest approach and thus would appear more big and bright than usual, N Sri Raghunandan Kumar of Planetary Society of India said. The planet can be seen with naked eyes an hour after the sunset in the eastern direction tomorrow. It will be visible all through the night and at midnight one can spot it in the southern direction at a higher elevation, he said. According to him, Jupiter, which has a large number of natural satellites, will be in ‘opposition’ tomorrow night. “A planet is said to be in opposition when it is directly opposite to the Sun from our view from Earth,” he said. At its opposition, the planet is fully illuminated by the Sun and appears disc-like, he said, adding, Jupiter's opposition occurs every 13 months. The last opposition of the planet occurred on October, 29, 2011 and the next will be January 6, 2014. Kejriwal and activists of his party took up issues plaguing farmers, tribals, fishermen, labourers and the poor during the 110-km rally. Kejriwal lashed out at the Maharashtra Government over the irrigation scam and sought support for the AAP. “Issues faced by farmers are important and should be dealt with. The country’s biggest irrigation scam has taken place here (in Maharashtra). Farmers are being deprived of their lands and now water,” Kejriwal told mediapersons in Roha. He said the AAP’s first rally in the state was to address farmers’ issues and that they should stand up for their rights. “Unless all political parties are thrown out, farmers’ demands will not be met unless a common man’s party acts in the matter. Farmers will not be given their rights unless they are a part of the system,” he said. Kejriwal was accompanied by Prashant Bhushan, Mayank Gandhi, Anjali Damania and other activists during the rally that took the participants three hours in buses and cars to reach Roha, 110 km from Mumbai. Kejriwal said he would also release a “black paper on irrigation” as against the white paper released by the government, which gave a clean chit to NCP leader and former Maharashtra Deputy Chief Minister Ajit Pawar in allegations of irregularities worth Rs 20,000 crore in irrigation projects in the state. Pawar was also the Irrigation Minister during 1999-2009. The Governor’s dilemma follows an unprecedented decision by the state Cabinet to refuse permission to the investigating agency to initiate prosecution against the minister whose resignation, on moral grounds, is still pending with Chief Minister N Kiran Kumar Reddy. The cabinet had recently adopted a resolution to this effect and sent the recommendation to the Governor for his approval. If the Governor approves the cabinet decision, the CBI cannot proceed with the case against Prasada Rao who has been named by the CBI as one of the accused in the disproportionate assets case of Jagan. The allegations relate to the allotment of 28,000 acres of land for the Vadrevu and Nizampatnam Ports and Industrial Corridor (VANPIC) project in Prakasam district. The controversial agreement was signed in 2008 when late YS Rajasekhar Reddy was the Chief Minister. As Revenue Minister in the YSR cabinet, Prasada Rao had signed the deal that allotted 28,000 acres of land for the project promoted by Ras Al Khaimah of UAE and its local partner Matrix Enports Private Limited owned by Nimmagadda Prasad who has since been arrested and lodged in a central jail here. In its charge sheet, the CBI alleged that Nimmagadda was allotted the land for the project in quid pro quo deal for his investments to the tune of Rs 840 crore in the business empire of Jagan Mohan Reddy. Apart from Jagan, former Minister for Infrastructure and Investments M Venkataramana and bureaucrat KV Brahmananda Reddy have been jailed in the case. Following the charge sheet, Prasada Rao submitted his resignation in August. However, the Chief Minister has been sitting over the resignation letter since then. With the CBI seeking government’s permission for prosecution, the Chief Minister got the cabinet endorse the move to reject the permission. However, a section of Congress leaders and the entire opposition have urged the Governor not to yield to the government’s pressure in the politically sensitive case. “The CBI should be allowed to do its duty fully and unearth facts,” senior TDP leader Y Ramakrishnudu said. Interestingly, a majority of the present ministers were also part of the YSR cabinet whose decisions have now become controversial for allegedly benefitting Jagan through quid pro quo deals. There are fears within the ruling Congress that if Prasada Rao was let off the hook, it could indirectly benefit Jagan. The Chief Minister N Kiran Kumar Reddy moved the AP SC/ST Sub-plan Bill 2012 in the Assembly which was specially convened for the purpose. The three-day session is expected to adopt the bill aimed at preventing diversion of funds meant for SCs and STs and ensuring that the budgetary allocations were fully utilised. “We are setting a role model for other states by providing legislative support to the SC/ST sub-plan. The legislation will come into force from 2013-14 budget and will make sure that every rupee reaches the targeted groups,” the Chief Minister said while explaining the objectives of the legislation. AP will become the first state in the country to give statutory status to the SC/ ST sub-plan once the AP Scheduled Caste, Scheduled Tribe sub-plan (Allocation and Utilisation of Financial Resources) Bill is passed by both the houses of legislature. The passage of the bill is only a formality since there is a political consensus on the matter. Earlier this week, the State Cabinet had approved the draft bill prepared on the basis of recommendations made by a cabinet sub-committee headed by Deputy Chief Minister Damodar Rajanarasimha. The new law would facilitate comprehensive development of SCs and STs and provide them protection and equality on par with other sections of society.”The need for such legislation was felt as funds allocated for SC, ST sub-plan were not utilised fully and efficiently, irrespective of the party in power. 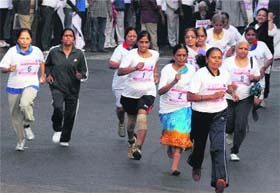 This is true of all the states in the country,” Kiran said. The SCs are allocated 16.2 per cent of the budget and STs 6.6 per cent, but spending remained mostly on paper as the funds meant for them are diverted for other programmes. At the end of the last financial year, a total of Rs 2,000 crore was unspent in the SC/ ST sub-plans. Some funds meant for SC, ST welfare were adjusted in accounts as notional expenditure. In the plan budget for 2012-13, the state had allocated Rs over Rs 8,000 crore under SC sub-plan and over Rs 4,000 crore under ST sub-plan. After the Chief Minister introduced the bill and highlighted its objectives, the Speaker N Manohar adjourned the house till Saturday.